Information: The first half of this book covered brief looked at the origins of G-Force, and how they started on the team. The second half included more Alex Ross sketchbook images (a mostly different selection than previously published in the Sketchbook issue, plus a four-page section of art and bios for the G-Force team. This issue was only available through a special offer in Wizard Magazine #132. Each copy came with a protective heavy plastic sleeve which included a holofoil Wizard logo, and a certificate of authenticity from Wizard and Top Cow. 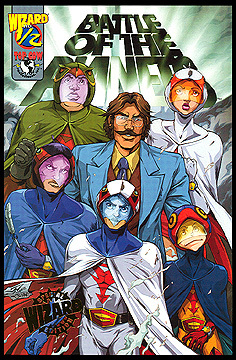 This cover design by Wilson Tortosa was adorned with a gold foil Wizard Special Edition logo, but there were alternate cover designs by Alex Ross and Joe Benitez. Art by Wilson Tortosa, story by Munier Sharrieff and Jason Hofius. Full Color. 18 - 21 - G-Force bios .